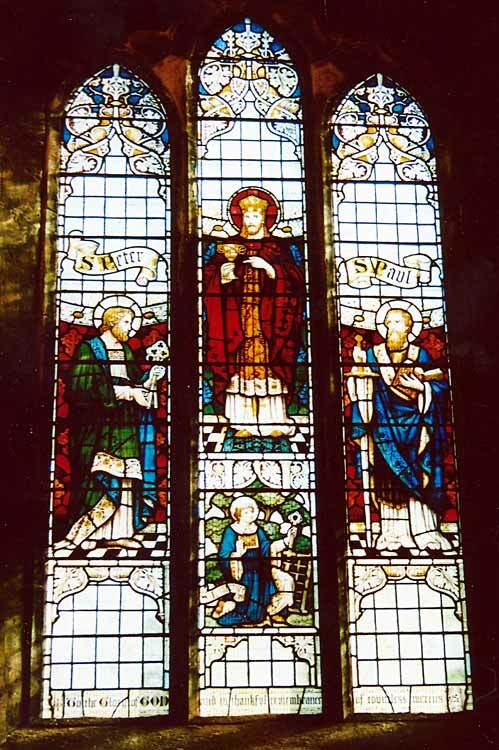 1.Set in the west gable there is a three single lancet arched window with leaded glazing and clear glass. The point of the centre light is slightly higher than that of the outer lights. 2. 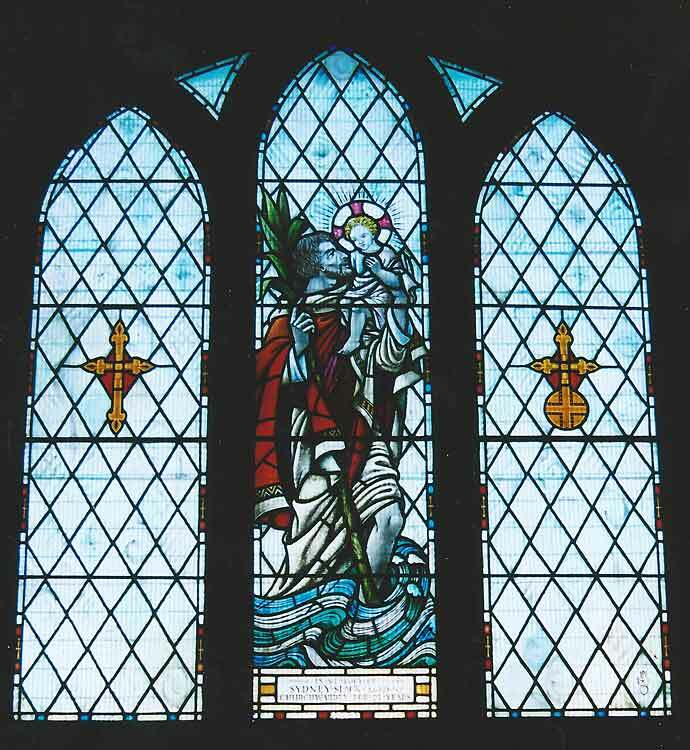 Set in the lean-to Baptistry below the light 1. is a flat headed, three light window with coloured stained glass; this is one of the memorials to the fallen of the Second World War. Viewed from the interior the south light shows a helmeted Saint Martin wearing a red cape and holding a sword. On his left side he is accompanied by his horse and on his right a gold and white Bishop’s mitre is included. In the bottom right corner a man is depicted holding out his hand in a begging position. Close to his left leg is a line drawing of a church on a hill. The centre panel carries the name Nicolas in a scroll top right and shows the Saint standing in a wooden boat, holding a cross in his right hand and a lantern in his left. 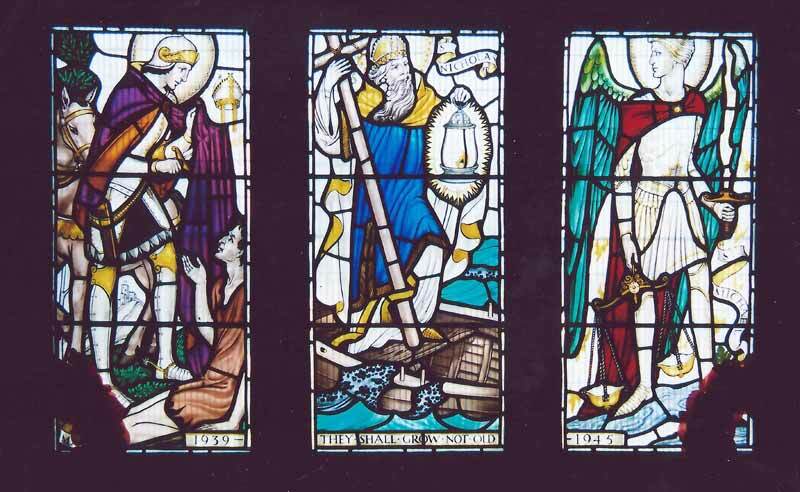 On the right is St Michael the Archangel, his name emblazoned on a scroll. He too holds identifying insignia, the scales of justice in his right hand and eternal torch of fire/light in his left. No maker’s mark is visible. 2A.A short lancet widow located in the west wall of the square tower over the North West door. 3.A single lancet headed light with clear glass set in lozenge patterned lead. The right light is decorated with only a simple gold crucifix in the centre, with the left light the same crucifix supported by an orb decorated with a cross. Most of the surrounding glass has a slight blue tinge. In the bottom right corner is the maker’s mark identifying it as the work of Pope and Parr, Nottingham. 7.Three lancets lights with plain glass in lozenge patterned lead. The centre light has a transom set in the upper part just below the arch. 9, 10.Two short single lancet lights set high in the gable. Plain lozenge patterned glass leaded lights. No maker’s mark on the glass or other information was found. In 1965 the then National Coal Board paid for the removal and storage of this window, fearing that it may be damaged by ground subsidence due the extensive coal extraction in the vicinity. 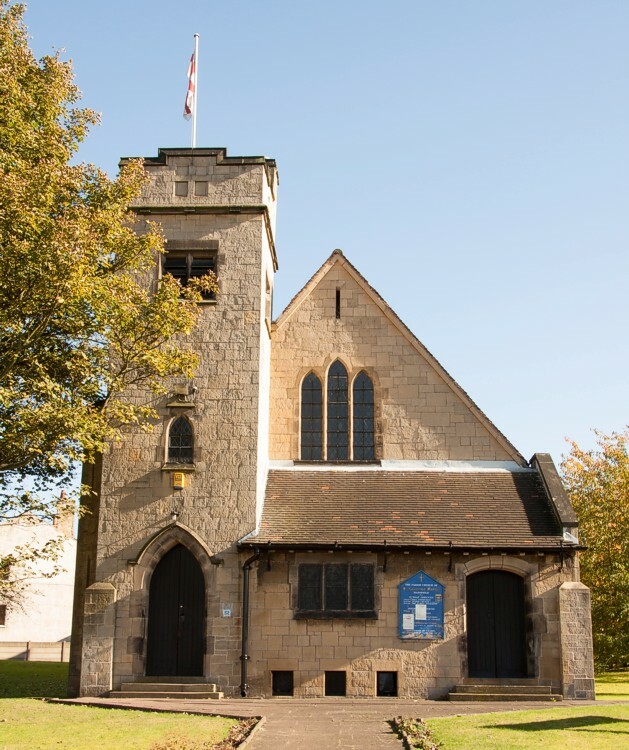 It was reinstalled and rededicated in 1967. 14.A single light as 3. 16, 17.Single lights as 3.